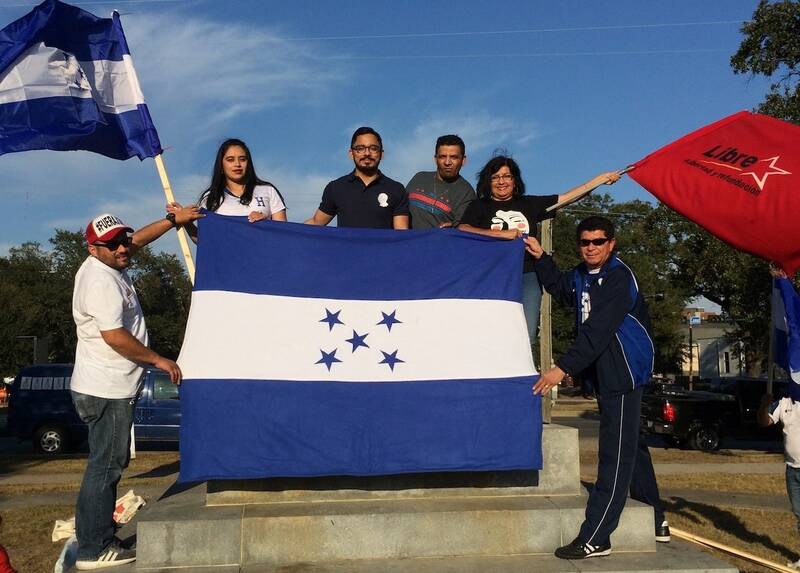 From left to right: Wilmer Toro, Johana Bardales, Edwin Peralta, Juan Carlos Canaca, Marta Zepeda, and an anonymous protester, with flags of Honduras and the Libre Party. Photos by author. José Danilo Rodríguez doesn’t live in Honduras. He’s lived in the U.S. since a little before Hurricane Katrina, part of the New Orleans-area Honduran community, one of the largest in the country. “I haven’t counted the years, but it’s a lot,” he says of his time in the U.S. By his calculations, it’s 13 years that he’s been working here in construction, “building houses for the gringos here,” he says with a laugh. He is one of a few dozen Hondurans, many joined by their children, who have gathered at the corner of Canal and Jefferson Davis in Midcity New Orleans for a cacerolazo, or pot-banging, a demonstration where participants use common kitchen items to sound their discontent. The tactic was first prominently used in the early 1970s, when Chilean protesters brought their empty pots to the streets in protest of food shortages. This cacerolazo, on December 3rd, 2017, was organized on Facebook. It’s one in a series of protests by Hondurans in the New Orleans area, which is home to about 25,000 Hondurans and Honduran-Americans, according to the 2010 Census. Following Honduras’s disputed election back in November, a group began gathering for nightly vigils at this spot. This afternoon, as the first participants arrive, they take turns waving Honduran flags and protest banners from atop what was the base of the Jefferson Davis monument less than a year ago. Signs sit on the base that once held a monument to Jefferson Davis. On Sunday, November 26th, Hondurans cast ballots to elect their next president. Nearly two months later, the protests continue. President Juan Orlando Hernández was declared the winner, but the Organization of American States (O.A.S.) found so many voting irregularities that they recommended throwing out the results and holding a new election. The very fact that a sitting president campaigned was controversial in a country where many still consider reelection fundamentally unconstitutional. Numerous Latin American countries, attempting to avoid anything resembling the dictatorships of their past, have maintained bans on reelection, though some have reversed these policies over time. It wasn’t until 2015, with great encouragement from President Hernández, that Honduras’s Supreme Court overturned the ban on reelection. Notably, former president Manuel Zelaya proposed a non-binding referendum to consider revising the same ban in 2009. This was given as one of the primary reasons for the coup removing him from power, but in Hernández’s case, the only repercussion appears to be popular mistrust. New York Times journalist Elizabeth Macklin says that, no matter what the law says, Latin America is generally distrustful of anyone seeking to remain in power. That’s certainly true of those gathered for this cacerolazo. “He forced the Supreme Court so that he could be reelected when, in Honduras, a president couldn’t be reelected,” says Edwin Peralta, who left Honduras at age 21 to join family in Kenner after his father passed away. Three parties joined forces in opposition to Hernández’s re-election, calling themselves the Opposition Alliance Against the Dictatorship and selecting Salavador Nasralla as their candidate for president. As the initial election results came in, it looked like the question of the legality of reelection might be moot: with 57 percent of the voting sites counted, Nasralla had a lead that election officials called “irreversible.” But in the early morning, the count stopped, inducing widespread skepticism. The silence lasted 24 hours. During his term, President Hernández led a crackdown on organized crime. He fired one-third of the police force after their ties to drug-related killings were discovered, confirming Hondurans’ long-held suspicion that the police were involved. He built maximum security prisons and authorized extradition so that suspected drug traffickers could be tried in the U.S. And he created a 3,000 member militarized police force called the Military Police of Public Order—hence the now-common photos of armed soldiers in the neighborhoods. Marta Zepeda makes noise with a pan and spoon. Hernández credits these tactics for Honduras’s sharp drop in murders—down 35 percent from 2012 to 2016, according to the Observatory on Violence at the National Autonomous University of Honduras. In October, Honduras’s Minister Advisor for Strategy and Communications wrote in a New York Times letter to the editor that Honduras “is decidedly winning its war against drug traffickers and criminal gangs” and “if [Hernández] is re-elected next month, criminals and drug traffickers in Honduras should prepare for a final defeat.” Hernández’s tough-on-crime approach has earned him supporters, but the O.A.S. says the election results are so flawed that it’s impossible to determine how many Hondurans voted to reelect him. In spite of Hernández’s mano dura (firm hand) approach, many Hondurans believe he’s actually enabled corruption. Evidence clearly incriminates various members of his administration. In 2013, as Honduran hospitals experienced shortages of supplies and staff, Hondurans began to speculate about where the money for their previously-adequate healthcare system had gone, since they were still making their monthly, income-based payments. By 2015, the nature and scale of the problem had come into focus: high-level government officials had allegedly used “a network of sham companies” to steal $350 million from Honduran Institute of Social Security. Hernandez has admitted publicly that these companies contributed $150,000 of this stolen money to his 2013 presidential campaign, though he claims he didn’t know where the money came from. Following pressure from the O.A.S., he allowed for an independent body called the Mission to Support the Fight against Corruption and Impunity in Honduras. Hondurans have voiced their support for anti-corruption efforts, but some worried from the beginning that this entity lacked the power to actually stop corruption. In January 2018, Honduras’s Congress passed a new budget law that would block the Support Mission and the prosecutor’s office from investigating or pressing charges against potential embezzlers. Meanwhile, the corruption continues. Government officials deliberately impeded the investigation of the 2016 murder of Berta Cáceres, a well-loved activist for indigenous and environmental rights. And some accuse Hernández of illegally concentrating his power or even funding his initial presidential campaign with drug money. A van displays a banner in support of opposition candidate Salvador Nasralla. He isn’t the only one who’s new to this. Johana Lizbeth Bardales Ayala is wearing a Honduras soccer shirt and carrying her country’s flag. She’s visibly pregnant and explains that she has an eight-year-old daughter in Honduras. “I don’t have much experience in politics, but we’re giving it a shot,” she says. Holding a protest for Honduras from the United States makes sense to Hector Sánchez, who hasn’t returned to his country since his departure 24 years ago. “The United States is a country where one protests,” he says. On Friday, December 1st, the current government set a curfew and directed the military to enforce it. Presumably this was an attempt to stop the protests and the looting, though critics of the president argue that the looters were his supporters instead. On the day of the Dec. 3rd cacerolazo, the Inter-American Commission on Human Rights and the Office of the United Nations High Commissioner for Human Rights in Honduras announced that 11 people had been killed so far in the protests. Two months later, that number has risen to at least 38, at least 21 of whom were killed by military police, according to the human rights group Committee for the Families of the Detained and Disappeared in Honduras. Ilda Sarmiento, who helped create and publicize the cacerolazo on social media, says it’s not just a Honduran issue: “We want to tell the United States to stop militarizing our country because we know that as long as they continue supporting the corrupt government we’ve got, we are going to continue living in a dictatorship… We hope the United States will stop getting involved in political matters in Honduras because we know that since the coup in 2009, our country has been militarized by the United States.” Reports indicate that some of the forces dispatched to break up protests were military police belonging to units trained by the U.S.
Later that month, the U.S. staked its position. Though 20 U.S. Representatives had signed a letter to Secretary of State Rex Tillerson demanding that the U.S. support the O.A.S.’s call for new elections, and 30 other legislators had called on President Trump to “suspend all security assistance to Honduras,” the U.S. State Department issued a statement on December 22nd congratulating Hernández on his victory. U.S. aid to Honduras, including security assistance, remains unchanged despite widespread human rights concerns. “We want to tell the United States to stop militarizing our country because we know that as long as they continue supporting the corrupt government we’ve got, we are going to continue living in a dictatorship." Those who know Honduras see beyond the violence. “We live in a rich country. Vegetation, fauna, everything a human being could desire,” says José Leónidas Argueta Argueta. “It’s something we miss very much. For us, it’s our dream.” Like many who’ve left Honduras, he says he didn’t really want to: “If we once left Honduras, it was because our need was great,” he says. Gina Amaya and her daughter Kathy. The sign loosely translates to "Better a f*cking protest than a f*cker who doesn't protest." Marina Mejía feels the same. “We want them to return our Honduras to us, the Honduras we had, a free and independent Honduras,” she says. For José Danilo Rodríguez, though, there’s no question in his mind—he wants to return to Honduras: “I’ve spent a lot of time working and working and not getting to see my mom, or give her a hug and feel her close, and that’s a nice thing… I’m getting old, ready to go back to my country to enjoy what little is left.” He explains that his strength for manual labor is running out, that he’ll have to work more slowly back in Honduras. His current goal is to stay in the U.S. for just two more years. Hernández’s re-inauguration on January 27th was the country’s first. Thousands of protesters marched to the Tegucigalpa National Stadium, the site of the ceremony, but were kept out by tear gas and barricades. Hernández, meanwhile, faces obstacles of his own. He must seek to reconcile the country in the shadow of an election many consider stolen. And, perhaps more challenging: he must try to convince Hondurans that he will not attempt to remain in power following this term. But recent developments suggest the divisions won’t soon be resolved. The U.N. sent a delegation in early February to meet with groups in Honduras to begin a mediation process, but leaders of the Opposition Alliance did not attend, choosing to instead send representatives with lists of their conditions for participating in the mediation. Among their conditions was the investigation of human rights violations and fatalities at the post-election protests. Afterward, Nasralla called the meeting “fruitful” but expressed his belief that the U.N. mission had “no interest in resolving the crisis” and referred to the U.N. Secretary General’s letter congratulating Hernández on re-election as a “bad message.” Later that week, he and more than 2,000 protesters demonstrated outside the U.N. building in Tegucigalpa, and an Alliance delegation again met with the U.N. mission. Just two days later, President Hernández and the National Party published a statement alleging that the opposition leaders had worked with criminal gangs to suppress votes for the National Party and that they didn’t attend the U.N. meetings because they feared investigation, though the statement provided little evidence for these claims. In a February 15th press release, Hernández’s government announced that he had called on the U.N. to investigate the role of gangs like MS-13 in the election. The Opposition Alliance denies these allegations, saying that it’s the National Party that worked with gangs. The two parties are engaged in a confusing finger-pointing circle, each arguing that the other is accusing them of the crimes of which the other is actually guilty. And on February 15th, the head of the popular O.A.S. anti-corruption mission resigned, stating that the mission wasn’t receiving adequate support from the O.A.S. or the Honduran government and that he was “extremely worried” about the Honduran government’s reaction to a judge’s decision to shelve a major corruption case under the new budget law. Natalie Yahr es una periodista y productora de radio con sede en Nueva Orleans, donde es la productora de noticias digitales para Listening Post New Orleans y trabaja por cuenta propia. También produce para la serie de historias contadas en vivo Bring Your Own, los espectáculos de marionetas de sombras Brought to Light y el proyecto #IAmAdultEd de Delgado Community College. | Natalie Yahr is a journalist and radio producer based in New Orleans, where she’s the Digital News Producer for Listening Post New Orleans and freelances on the side. She also produces for the Bring Your Own live storytelling series, the Brought to Light shadow puppet series, and Delgado Community College’s #IAmAdultEd project. While Trump was summiting with Kim Jong-Un, nuclear-impacted communities convened on their own terms.